Welcome to Harry's Classic Car Cruise In page. 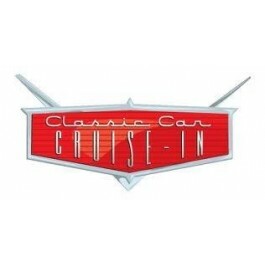 Below you can find information on local cruise ins. 2019 will mark the 10th year for the Laytonsville Cruise In. Started by Harry Kraemer, this has become one of the more popular cruise ins in Montgomery County with folks coming from as far as Frederick County, Carroll County, and even Washington D.C.
Harry has made a standing reservation at Julliano's Brick Oven Pizza for a large table every Friday evening for the folks attending the cruise in. Harry & Pat arrive at 4pm every Friday (year round) to hold the table and to start getting some vehicles in place. In February 2018 a new shop opened in the shopping center where we have our Friday night cruise in. The Family Room. They have coffee, snacks, and specialty items for sale. Click here for info on a Wheels, Wings, and Keels event at Hummel Field in VA. This is a very nice event if you enjoy, boats, classic cars, and aircraft. The Laytonsville cruise in is held every Friday night in Laytonsville, MD. Enjoy classic cars and brick oven pizza at Julliano's Brick Oven Pizza. Click on the link below to see pictures of their famous desert they call the volcano. See the link below for pictures. Jimmy Cone in Mt. Airy, Maryland is held on the first and third Saturday of the month April to October. Usually there will be 100 plus cars there. Great evening with lots of local food. Connect with Harry on Facebook (Kraemer Aviation) to get quick updates, show news, and more. Our Facebook page has cool pictures of aircraft, vintage motorcycles & cars, and more. Pictured here are a few pictures of the Thunderbird In that was located in Essex Maryland (Harry's hometown). This is one of the first cruise in spots that Harry would visit in the 60s and 70s. Harry is also pictured with his first car, a 1972 Camaro. For information on car shows and other cruise ins visit our events calendar. If you are buying a classic car or motorcycle check out the market watch section of Flymall.org at http://flymall.org/market-watch/. This is a searchable database of prices, searchable by any combination of make, model, and year. With fine restaurants such as Julliano's Brick Oven Pizza, and The Office right in the shopping center you can enjoy dinner and some fine classic cars. Pictured here are a few pictures of the Thunderbird In that was located in Essex Maryland (Harry's hometown). This is one of the first cruise in spots that Harry would visit in the 60s and 70s.